Having won a second promotion in two years, Jimmy Mullen had the task of signing a new left-back in 1994 with Les Thompson opting to turn down a new contract offer and opting instead to sign for non-league Accrington Stanley. His search took him north of the border to Rangers for their England under-21 international Chris Vinnicombe. He'd been with them for almost five years without ever winning himself a regular place in the side. His move to Rangers was in November 1989 when he left his first, and home town, club Exeter City in a £150,000 deal. Vinnicombe had been with Exeter since signing schoolboy forms at the age of 14. He'd worked himself up through the teams and eventually made a first team debut in September 1988 as a substitute at Doncaster. He was originally a left winger but by then had been converted into a left back and quickly established himself in a team that, in his second season, was on its way to promotion from the old fourth division. But they achieved it without Vinnicombe who was sensationally sold to Rangers in November 1989 in that £150,000 deal as manager Graeme Souness was looking to strengthen the Ibrox squad with English players. He spent over five and a half years there but in that time made only 27 first team appearances although he did break into the England set up at under-21 level. You wonder whether he'd have ever got anywhere near that had he remained at Exeter but a place in Rangers' reserve team was enough and saw him play 12 times for his country at that level, and as captain in some of them. 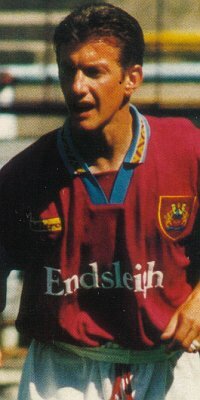 By the summer of 1994, and with Walter Smith now in charge at Rangers, he was made available and Mullen broke the club's transfer record to bring him to Turf Moor as his first summer signing following the play off win against Stockport County. He quickly settled into the team at Turf Moor, despite a mistake in the last minute of his home debut that saw Stoke come back to draw 1-1, and was a regular until we travelled to Reading in November when we travelled to Reading and he came up against their Australian full back Andy Bernal. This thug, who later went on to be David Beckham's personal assistant, left Vinnicombe with a broken jaw and out of the Burnley team for months. By the time he returned we were fighting a relegation battle, one that was lost, but he quickly established himself back in the team and remained first choice until the departure of Mullen as manager in February 1996. New boss Adrian Heath soon replaced him. He was quickly replaced as we fought, this time successfully, another relegation battle and didn't feature in any of the last ten games that season. Into the new season, the 1996/97 season, and Vinnicombe found himself immediately on the sidelines. That's where he remained for much of a season that saw him start only six games. That changed once Heath had gone and he was back in the team early in the next season, but by Christmas he'd lost his place again with Mark Winstanley preferred and with another relegation battle to fight he again found himself mainly on the sidelines. In just over two years he'd played for three different managers in Mullen, Heath and then Chris Waddle, and with a fourth about to step in, namely Stan Ternent, it was time for the out of contract Vinnicombe to move on and he signed for Wycombe Wanderers, who like us were in the third tier. He had six years there with the highlight being the 2000/01 season when he featured in an FA Cup semi-final against Liverpool. All told he made 263 appearances for Wycombe before making the decision to return to Devon and drop into non-league football in the summer of 2004. He signed for Tiverton Town and later returned to his first club Exeter City who by now were playing non-league football themselves. He played just four times before returning to Tiverton where he remained a player until the end of the 2007/08 season. His next move took him to Witheridge in the Devon & Exeter League. He was appointed player/manager for the 2008/09 season and was there for two years before returning to Tiverton as manager in the summer of 2010. That, unfortunately, didn't last. They had a difficult time and he left in December of that year claiming the job had come too early in his management career. Within a couple of weeks he was appointed manager of Elmore and remains there at the time of writing. In his early days at Exeter he was being billed as a top player of the future. It didn't quite work out that way but he had a long career in the game, playing over 400 games in league football as well as pulling on an England shirt on twelve occasions.